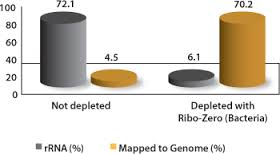 Yesterday I did the Ribo-Zero treatment of the 24 samples for our final RNA-seq analysis. It was a bit complicated to plan because I was using a kit designed for only 6 samples (because the kits are so expensive). Luckily we had leftover reagents from the 72 samples we treated last summer, which let me set up reactions that were 3/4 of the standard volume. The kit removes the abundant ribosomal RNA from the sample, leaving only the desired mRNA and some small RNAs for sequencing. It works by first annealing tagged oligos to the rRNA, and then removing the rRNAs with magnetic beads that bind to the oligo tags (probably biotin?). We had quite a lot of the buffer and oligo solutions left from last time, but no beads. A mixup had led to the beads in the new 6-sample kit being ruined by being stored at -80 °C rather than 4 °C, but Illumina very kindly provided us with replacement beads. The replacement beads came with a new tube of the solution used to resuspend the beads after their preliminary washing, so I was able to resuspend the beads in 3/4 of the volume needed for 24 samples rather than 1/4. 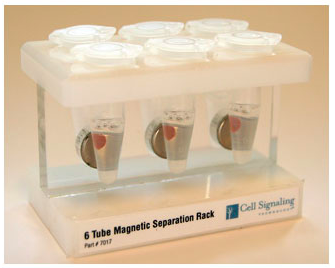 Using the larger volume was important, because the separation step depends on the right relationship between the liquid in the tube and its position in a special rack with magnets on one side. The final step is to ethanol precipitate the depleted RNAs and resuspend them in a special buffer for the first library-prep step. The former RA is going to do the library prep and sequencing in her new lab (she also provided the Ribo-Aero kit), and she's given us the buffer for the resuspension. Right now the 24 ethanol precipitations are in the -20 °C freezer; this morning I'll spin them down (30 min, because the concentrations are so low), wash tyhe pellets carefully with 70% ethanol, dry them carefully, resuspend them, and deliver them to her. Then I'll give a big sigh of relief and move on to other projects.